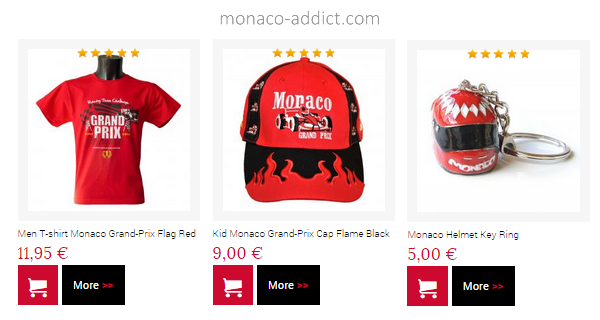 Web Samba MC is proud to announce the release of Monaco Addict, the new online shopping resource for Monaco memorabilia, from fashionable caps and accessories celebrating the world-famous Grand Prix to local souvenirs and many other items. Monaco Addict is the brainchild of two Monaco-born designer friends sharing a common passion for their birthplace and city, and eager to spread the very special magic of this place. “The spirit of luxury, glamour and seduction that surround us here creates a real inspiration,” says Linda Boes, co-founder of Monaco Addict. “Now with Monaco Addict anyone can buy Monaco Fashion items from anywhere, as if they were tourists in Monaco, without having to waste time queuing in the shops, or spending money to travel there,” she adds. “Through our website, you can almost feel the spirit of Monaco… as if you were here, and that’s what we try to share through our social networks”. 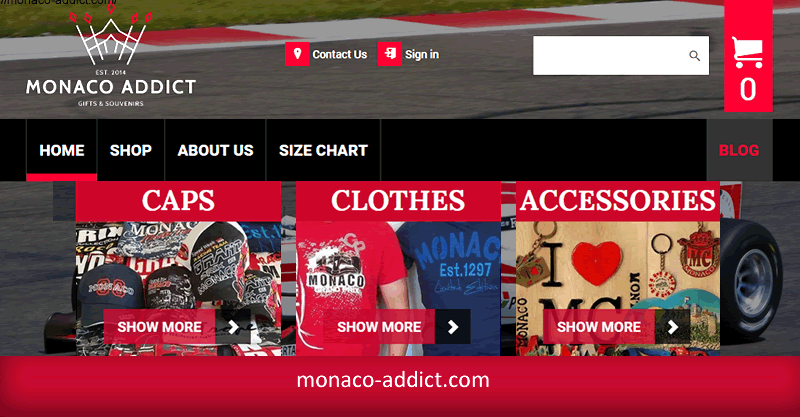 On top of Monaco-branded garments, accessories, and memorabilia, Monaco Addict offers a flurry of travel tips and ideas on its information-rich blog. “Besides providing a world-class e-commerce website to our valued customers, one of our top priority was to develop a top of the line blog easy to update and main the long run,” says Linda Boes, a challenge undertaken by Web Samba MC, the most talked-about online marketing specialist of the Principality. “The folks at Monaco Addict knew precisely what they wanted,” says Chris Clavel, director of Web Samba MC, “and we gave them exactly that: a powerful e-commerce platform that scores high on Google, loaded with marketing and merchandising plugins and a user-friendly inline CMS to top it all off”. “Supportive as they may be, I really appreciate not to have to call the technical folks every time I need to publish content or launch a new line of products, which also saves us a bundle on routine maintenance tasks,” confirms Linda Boes who had been shopping around for the right content management system for months before finding out about the open source CMS SeoToaster and Web Samba MC, its exclusive distributor in the Monte Carlo area. “The site is launched on high speed rails with smashing results on search engines and social media, but we will accompany its growth with foreseeable and measurable results using only the most cost efficient online marketing techniques,” concludes Mr. Clavel. With such a determined and experienced partner to develop its activities in Monte Carlo and all around the world, Monaco Addict is set to become the #1 website to grab the best Monaco items at a great price without even having to ever set foot in the Principality. Monaco Addict carries caps, garments, souvenirs and memorabilia items in the spirit of luxury, glamour and seduction from the world-famous Monaco area. All Monaco Addicts proudly displays the best of the Monaco brands (tee-shirts, bags, magnets, keyrings...) inspired by the Formula One Grand Prix, the stunning city features and its French Riviera surroundings, as well as the high-profile Castle, lavish seaport, mind-blowing casinos and world class resorts. Web Samba MC is a dynamic digital agency founded by Chris Clavel and specialized in website design, online marketing automation, including social networks marketing. WebSamba MC provides high-performance and cost-effective online marketing services for small and medium businesses, allowing them to rank higher than their competition on major search engines. For more information about WebSamba MC, please contact Chris Clavel by email at chris.c@web-samba.com or by phone at + (33) 675 637 635.